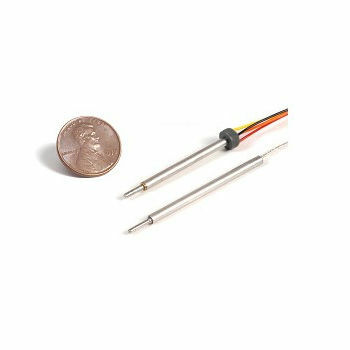 This micro-miniature SM-LVDT-SP is designed for high resolution position measurement in tight places. It is layer wound on metal coil-form provides excellent stability, while ferromagnetic housing takes care of the electromagnetic and electrostatic shielding. With his 2.3 mm Diameter, frequently use in several applications. Micro-miniature spring-loaded LVDT designed for high resolution position measurement in tight places (2.3 mm Diameter). Measuring range: +/- 1, 2.5, 5mm. Input voltage: 2.3 Vrms max. Input Frequency: 5 kHz (nominal). Protection against electromagnetic and electrostatic shielding.